Sothern Railway Loco` 225S by Colin Binnie. Will you let me have a loco drawing this month , said Roy Dock. But of course I replied. And after he had rung off I realised I was commited to following the magnificent locomotive portrait feature by Burnard Wright published in the July issue. What locomotive could I chose that possibly would compete with a rebuilt Merchant Navy ? Here is my choice; if I cannot outvie with sheer size, let the character of the engine do it for me. I determined on No225s. Which I believe was the smallest engine the Southern had. A really interesting little engine it is too, With bags of character and a fascinating history. The story begins in 1876. when drawings prepared at the Ashford Works of the old South Eastern Railway for a class of six tiny 0—4-0 saddle tanks. These were intended for light shunting duties at such places as Ashford Works itself, Bricklayers Arms and Reading yards and at Folkestone and Dover harbours. While construction was authorised by the board and the money allocated, nothing actually happened and the project was shelved. In 1881 the situation at Folkestone harbour was getting desperate and James Stirling was asked to do something about providing a suitable engine in a hurry. Out came the 1876 drawings and an assessment made of their suitability for current construction. The large dome that Mr Cudworth had found necessary only five years earlier was not in accord With the Stirling family tradition, so a new, domeless boiler was substituted, a few minor changes made and the drawings passed out for costing. The price quoted by the works Was £870. The price for one-off having risen considerably from the 1876 price of £675 off each quoted for the Cudworth engines. The Board decided that this price was unacceptable and instructed Stirling to purchase a suitable standard locomotive from an outside contractor. Our first drawing depicts the engine that never was, equipped with the Stirling boiler. 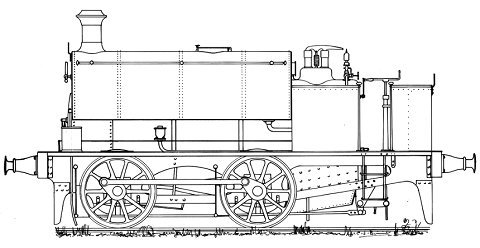 The second drawing depicts the engine which was purchased. The diminutive engine was obtained from Messrs Manning Wardle & co in 1881 for £78O. It Was numbered 313 (Works No. 767). As delivered there was no cab. merely a weather board, but before long a roof supported on four iron stanchions was provided. Our second drawing and first photograph show the engine in this condition. No 313 in early guise at Folkestone. Note the five link coupling and odd livery. I am not sure whether the rear end of the roof was as shown in the drawings but, While I have no more evidence than this photograph and my interpretation is not infallible, I am of the opinion that it Was. The date of the fitting of the new cab is unknown to me but our second photograph, taken in 1902, shows it very much in evidence. The engine was in the shops for new cylinders in 1893 and was reboilered in 1904. Nine years later it Was back in the works for overhaul following a derailment. In 1918 Our engine got involved with a cross channel steamship in another mishap. The S.E.C.R. Steamer Onward caught fire while in harbour in the Septernber of that year and innocent little 313 was rushed in to help pull wagons clear of the inferno. The fire fighters were unable to prevent the fire spreading outside the ship and the decision to scuttle her alongside the quay was taken. As Onward settled she heeled away from the quay and mooring wires parted, one by one. It was at this stage that 313 became entangled in the proceedings, literaly, for one of the broken wires ensnared the engine. As tension on the wire increased with the heavier list of the ship it tautened, pulling the engine towards the the quay slowly. Luckily, the engine driver and fireman were able to cut the wire in time to prevent our story coming to an abrupt end. The ship was refloated and lasted until 1948 though not in railway service. 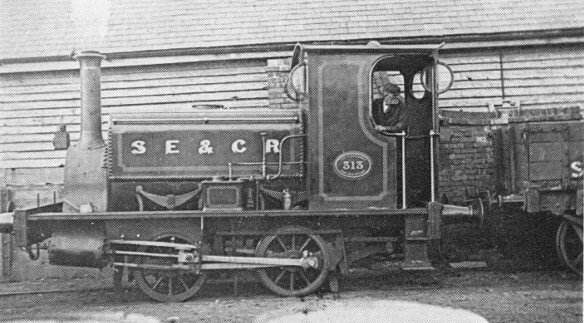 By the middle of 1919 the engine was on the Ashford scrap heap. It stayed there until 1925 and then was taken into shops, refurbished, equipped with a new smoke box and the rather ugly chimney shown in our third drawing. 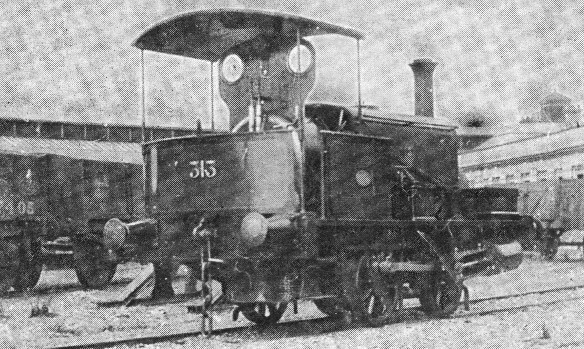 For a while the engine was employed at Ashford. bearing the new number 225s. 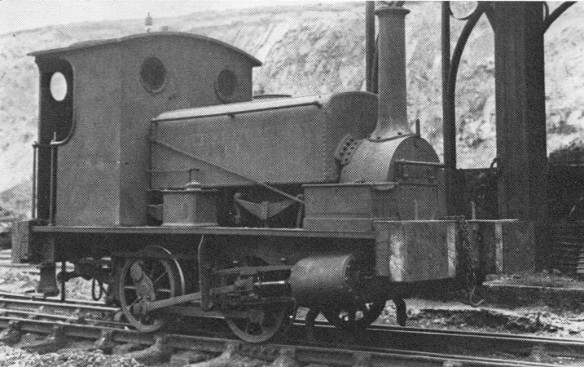 Two years later it was sent to Melidon quarry as a shunter, where it remained until 1938 when it was sent to Eastleigh works for boiler repairs. Examination showed that 225s needed more than a few patches and, making its second acquaintance with a scrap heap, it was withdrawn. This then is the bald history of my little champion. There is however, one minor structural mystery; buffers. In our first photograph th original 12 inch diameter heads are shown, in our second and third views the heads have increased to 15 inch diameter. A photograph taken in 1928 by Mr H. C. Casserley Shows the engine at Meldon quarry with these buffers, while our last photograph shows her with the quarry as a background without any buffers at all. Another photograph depicting the engine on a low flat wagon after arrival at Eastleigh in 1938 shows her with coach-style buffers with the tops and bottoms removed. When did this final shuffe of buffers take place? The painting of the engine presents a few problems as well. On the original copy of our first photograph the main panels are of middle tone bordered by a much darker tone. While a lighter band With incurved corners runs between the two — this band being much narrower than the later S.E.C.R. lining in photographs two and three. No other South Eastern or S.E.C.R. photographs I have seen show a livery in the least like it, Does reader know the answer? Note the way the cab windows open. Folkestone c1902. At Meldon Quarries near Okehampton Devon. About 1881 — the birth date of our engine the S.E.R. had two locomotive liveries in use. The older livery Was chrome green with the lining having incurved corners but no darker outer border. The later livery was a beautlfully gloss black, which would hardly show as varying tones in a photograph. Had Stirling been trying to copy brother Patrick of the Northern? The Wainwright livery Of Brumswick green with blue—green banding, fully lined out vermilion buffer beams and great gilt lettering on the tank must have made her a real dazzler of an engine. 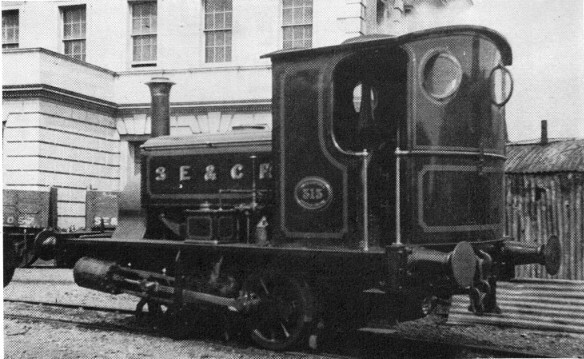 Even the Southern Railway did its bit to make the engine unique. 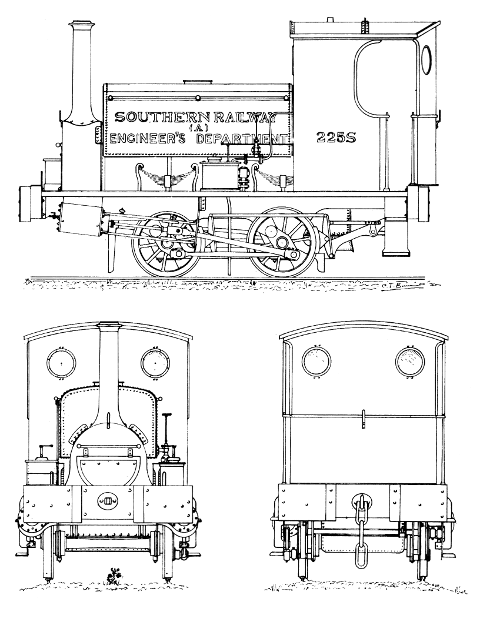 As will be seen from the drawings, the words Southern Railway were emblazoned on the side; I can think of no other Southern engine With the word railway included in the title. One can only Suppose from the style of lettering that the Standard transfer would not fit on the diminutive tank Sides and a coach transfer was used. The Style of lettering would seem to support this supposition, Since it is completely at variance with the A and the Engineers Department below it. Before I finish I must own up to an error on the drawings. 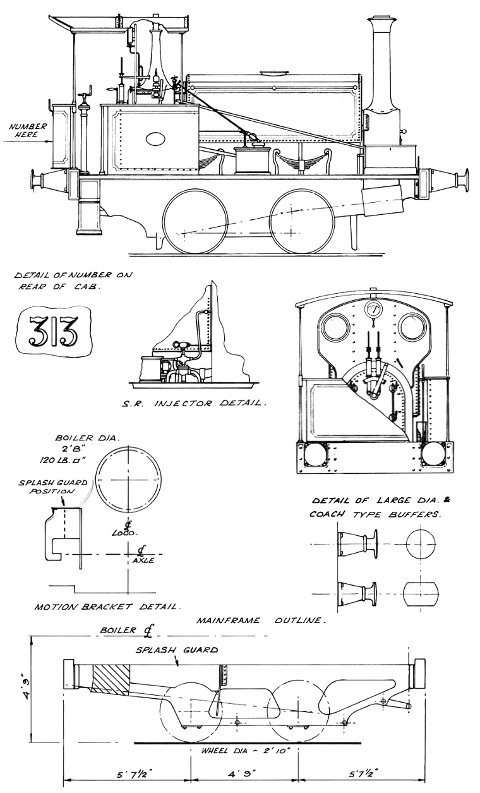 The injector so prominently visible on the side of the locomotive in our third drawing was not like that in Southern days- among other things, the handle was arranged differently. The correct version is shown separately and that shown on the drawing proper is appropriate to the S.E.R. and S.E.C.R. phases only. This Homer didn`t just nod. he fell asleep.